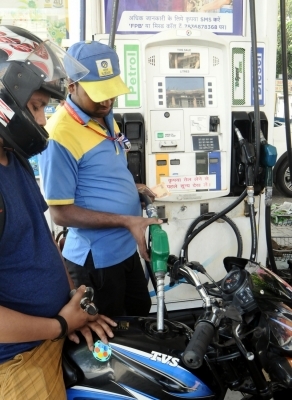 New Delhi Sep 15 (IANS) Fuel prices in the country hit a new benchmark on Saturday with the price of petrol in Mumbai touching Rs 89 per litre for the first time ever. It was priced at Rs 89.01 in the financial capital of the country up from Rs 88.67 per litre on Friday data on the Indian Oil Corp s website showed. In the other key cities of Delhi and Chennai too petrol prices climbed fresh highs of Rs 81.63 and Rs 84.85 against the previous levels of Rs 81.28 and Rs 84.49 per litre respectively. Cost of the key fuel in the eastern city of Kolkata rose to Rs 83.49 from the Friday s level of Rs 83.14 per litre. The all time high in the city is Rs 83.75 recorded on Tuesday September 11. Cost of the other transportation fuel diesel also increased on Saturday. In Delhi Mumbai and Chennai touching fresh record levels of Rs 73.54 Rs 78.07 and Rs 77.74 per litre against the previous levels of Rs 73.30 Rs 77.82 and Rs 77.49 per litre. In Kolkata it is 43 paise short of the record high price of Rs 75.82 hit on Tuesday. Diesel in the West Bengal capital was priced at Rs 75.39 on Saturday up from previous level of Rs 75.15 per litre.